You don’t see him, but he is present. He is all around us. He keeps things running. No, we are not talking about Him, nor about The Force. We are talking about Apache ZooKeeper, the under-appreciated, often not talked-about, yet super-critical component of almost all distributed systems we’ve come to rely on – Hadoop, HBase, Solr, Kafka, Storm, and so on. Our SPM, Search Analytics, and Logsene, all use ZooKeeper, and we are not alone – check our ZooKeeper poll. 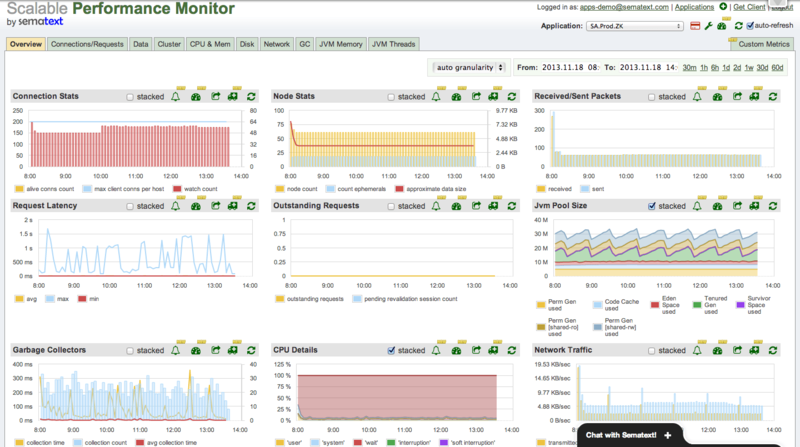 We’re happy to announce that SPM can now monitor Apache ZooKeeper! This means everyone using SPM to monitor Hadoop HBase, Solr, Kafka, Sensei, and other applications that rely on ZooKeeper can now use the same monitoring and alerting tool – SPM – to monitor their ZooKeeper instances. Please tell us what you think – @sematext is always listening! Is there something SPM doesn’t monitor that you would really like to monitor? Please vote for tech to monitor! Want to build highly distributed big data apps with us? We’re hiring good engineers (not just for positions listed on our jobs page), and we’re sitting on a heap of some pretty juicy big data!